How do I eliminate my carbon footprint? Estimate your current carbon footprint. You need an actual number, so you know how much you need to eliminate. Reduce what you can. Take concrete actions (see below) to reduce as much of your own direct footprint as possible. Offset the rest. Pay or invest (see below) to reduce greenhouse gas emissions elsewhere, until your net emissions are down to zero. Your “net carbon footprint” is the sum of all your activities that increase emissions, minus the sum of all your activites that reduce emissions. If you get on a plane, you increase your net footprint. If you switch from fuel car to electric car you reduce your net footprint. The goal is to get your net emissions down to zero. 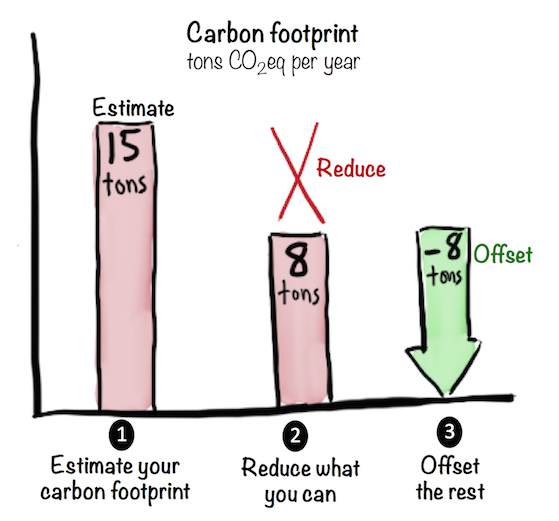 Statistically, your carbon footprint is somewhere in the range 3-18 tons CO2eq per year. This correlates pretty closely to income level. So if you have a relatively high income, you’re probably on the upper end of the spectrum, and vice versa. How dirty your region’s electricity is. See ElectricityMap.org. Green is good, brown/black is bad. Think about it, and just pick a number that feels roughly right. Fly less, replace with train when feasible. Replacing plane with car for the same distance makes very little difference (unless you ride share, or drive an electric car). Rule of thumb: Avoid flying when you can, offset it when you can’t. Drive less fuel cars. Replace with electric car, bike, train, or walking (depending on your context of course). Impact: Fuel car 300g CO2eq/km, Electric car 100-250g (depending on how clean your electricity grid is). Hybrid is somewhere between Fuel and Electric. So switching from fuel to electric will reduce your footprint by 50-200 grams per km (source). Do the math. Keep in mind, though, that the footprint of the electric will automatically shrink over time as your electricity grid gets cleaner (which is a clear trend). Buy green energy. Buy solar panels and put on your roof, or switch electricity provider to one that uses primarily renewable energy. Impact: about 0 - 3 tons, depending on how much electricity you use, what type of power plants are on you grid, and what alternatives are available to you (source). See Electricity Map to determine the average carbon footprint of energy production in your country. If it’s brown or black, you have a lot to gain from switching. If it’s already green, it probably won’t make a difference. You can never reduce your direct footprint to zero, since just being alive carries a carbon footprint. But if you combine reduction with offsetting, you can reach a net footprint of zero. Offsetting basically means paying or investing to reduce carbon emissions somewhere else, not directly related to your existence. A ton is a ton, no matter where it is reduced. So how much have you reduced, and how much do you have left that needs to be offset? Here are some websites offering you to pay to reduce carbon emissions. GoClimateNeutral.org - pay a monthly fee, and they buy carbon offsets. They continuously research to find the most effect ways of offsetting. Very little work on your part, just sign up and start paying. Here are some websites offering you to invest to reduce carbon emissions. The difference is that here you can expect to get a return on investment (at the cost of slightly more admin). Trine - Crowdinvest in solar panels in Africa, help people get electricity, reduce CO2, and get your money back with interest. Note that the effectiveness (in terms of CO2 reduction per €) varies quite a lot from project to project. Do the math, the numbers are clearly visible for each project. Divide the total investment amount by the expected CO2 reduction. The best projects are at 20€/ton or lower. BrightSunday.com - Finance solar panels in various parts of the world. The difference from Trine is Bright Sunday is more aimed at companies, with larger recurring transactions, as opposed to the smaller one-off investments for Trine. Here we’ll add links to stories from people who have reduced their carbon footprint to zero (or at least made good progress along the way). everytoncounts is maintained by crispab. This page was generated by GitHub Pages.